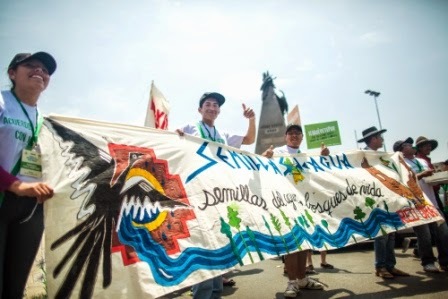 During the UN’s COP 20 meeting in Lima about climate change last December, our Presbyterian group took part in a people’s march in Lima’s streets, joining the rallying cry, “Cambiemos el sistema, no el clima”: “Let’s change the system, not the climate!” And when we came back, participants from Peru, Bolivia, and the U.S. together wrote a Statement on Climate Justice expressing commitments to work for change. The connections among mineral and human exploitation, consumerism, corporate greed, world economics, and climate change have been on my mind for years. 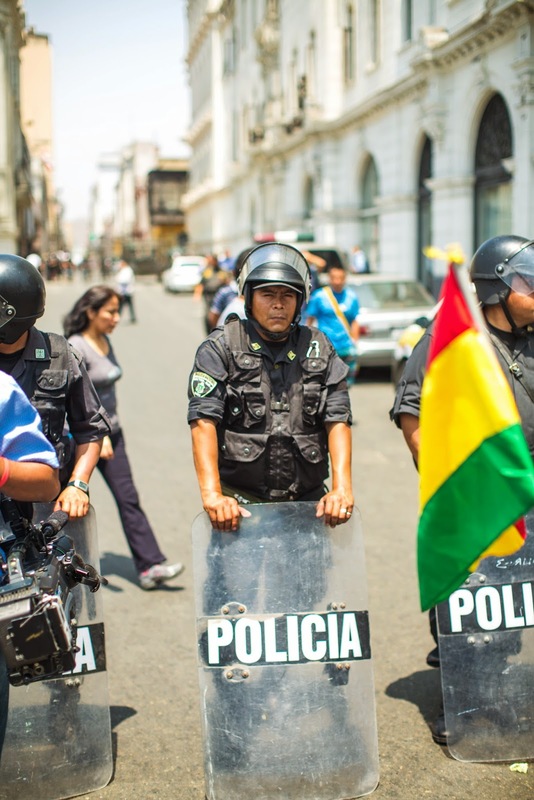 But confronting this death-dealing web in Peru, and hearing it described by people whose lives are caught in such powerful, senseless realities, convinced me that audacious calls to change the system—and to change it fundamentally—may not be as mad as they sound. They sound like pipedreams. Change a system that’s been in place as long as anyone living can remember? Let’s protest the law of gravity and levitate our way to the moon while we are at it. In fact, according to Sinai law, God’s universe is founded instead on fairness, on sharing, and thriving. Deuteronomy’s “Choose life!” means just that. Violence against humans and against the earth is not endemic to an otherwise good cosmos. It’s merely most of what our generation has ever known. I was raised with a few democratic values intact. I understood voting as the primary duty of citizenship. I thought we were electing proxies whom we could trust to do their utmost to represent the common good, taking “common good” to mean the good of the commons, the commoners, regular folks. I don’t have, and don’t think I should have, expertise to second-guess professionals whom I hire to work for me—car mechanics, electricians, teachers, doctors, for instance. Thankfully, most people perform their work with pride and professionalism. No adult who gets a paycheck should do any less. But if most people perform their work with pride and professionalism, we should be wondering why citizens are forced to bird dog our own public servants, hired with tax money to serve us. I was raised to think elected office was a high calling to be taken to heart, treated with respect, and expertly carried out. But now, we who weren’t trained in politics must oversee many public servants who forget who their bosses are. That’s what’s mad—or would be, if we weren’t so inured to it. People I met in Haiti several years ago kept asking me to convey messages to President Bush as if I could drop by the White House for coffee. Even in Peru, I had the humiliating feeling, as I’ve often had in Palestine, that those explaining their plight gave me far more credit to amplify their concerns than I could ever earn. It makes me feel incompetent, untrustworthy, ashamed to hear such pleas while enjoying another country’s hospitality. Then I remember that public policy for the common good is a job I’m paying officials to do, not one I’ve been trained, paid, and commissioned to carry out myself. Perhaps it’s to American democracy that Haitians, Palestinians, and Peruvians are giving more credit than it’s currently earning. If a Target employee weren’t doing his job, would his manager have to sign petitions, write letters, and take to the street with placards and costumes to convince him to work? So why do we? Nevertheless, we do. And it strengthens our walking, carrying, shouting muscles. Even if it’s a system of failed politicians, corporate greed, and numb consumption that we have to change, still I believe there is hope. Sometimes we can see effects. Not always, but lately, it seems, perhaps more often. 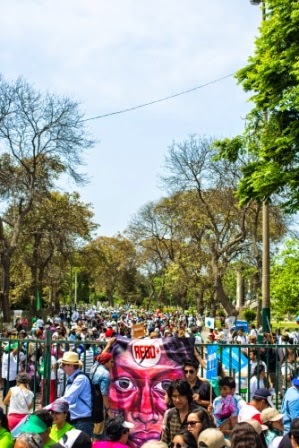 The climate march in December in Lima involved tens of thousands of Peruvians and hundreds of foreigners like us. 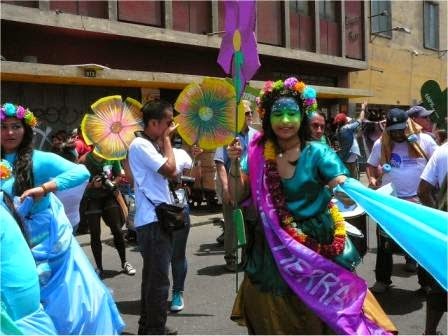 While not as visible here as September’s New York City climate march, the Peruvian march was just as imaginative, multicultural, and musical, and far more exuberant, far more colorful. Did it make a difference? I think so. The lines of influence are hardly traceable, but they do exist. We can’t know who was changed, and who they changed, and who they talked to, and who went to the White House for coffee. But in January we heard a state of the union address that not only mentioned climate change but declared it a priority. That’s a change. A new pope is also declaring it a priority. That too is a change in the system. Last week in Indianapolis, dozens of people of faith, rallied by my colleague Mike Oles at Hoosier Interfaith Power and Light and others, attended a statehouse hearing to state their objections to a proposed House bill that was evidently ghostwritten by Indiana’s for-profit utility companies. The fact that they showed up is a change. From what I heard, these citizens were treated rudely and given little time to speak. Yet within 24 hours the bill was dead. Evidently it was seen as unpropitious even by its sponsors. People who took time from work and family to travel to the statehouse to bird dog their public servants actually succeeded in averting a threat to dismantle distributed rooftop solar. This is a change, at least for now, a change that will inspire further activism, because it works. On the same day, President Obama announced that the U.S. legislature’s bill supporting the Keystone XL Pipeline had earned his veto. Two years ago, few people had heard of KXL, but thanks to activism across the U.S. and the world, it is now a rallying point for people who object to climate change. And just as I was writing this, news arrived of a Reuters poll revealing that two-thirds of Americans now hold world leaders morally accountable to take action against CO2 emissions. The poll also indicates that some public servants are beginning to seek “new messaging” about climate change. I’d frankly prefer they seek facts over messaging, but I guess you can’t change a whole system in one step. What’s behind these changes? Could it actually work to tell our public employees what we expect of them? How many citizens does it take to change the lights our elected leaders live by? To cite another rallying roar: "Tell me what democracy looks like--THIS is what democracy looks like." I'd rather democracy looked less like a Rube Goldberg machine. But whatever gets the job done. Thank you, friends in Peru, for your persistence, grace, and abiding hope. Thank you for all you have taught us! 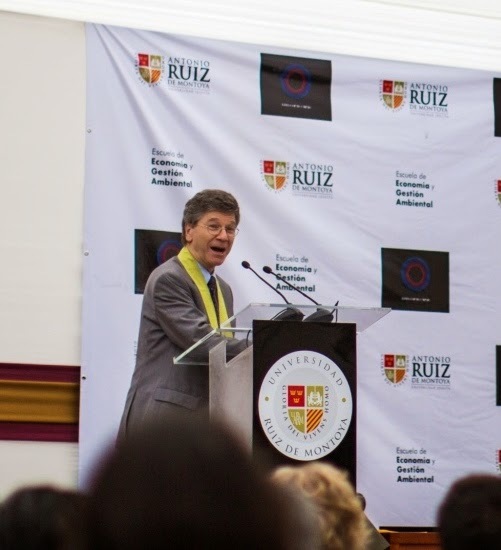 Back in Lima the next day, we attended the Interfaith Commission Conference on Climate Change, featuring American economist Jeffrey Sachs. Sachs talked about the history of industrialization that arose with the power of fossil fuels beginning 250 years ago with the steam engine, which changed the world in every way. Intensive industrialization arose. The population exploded. Wealth disparity grew—higher living standards for some, exploitation for most. 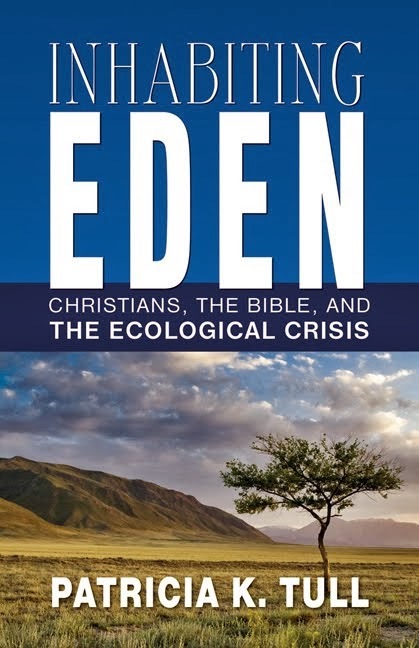 Humans have throughout history created local environmental crises, he said (I think immediately of the destruction of the great cedars of Lebanon by ancient empires, and the irrigation of Tigris and Euphrates farming areas that quickly left the soil too salty to plant). 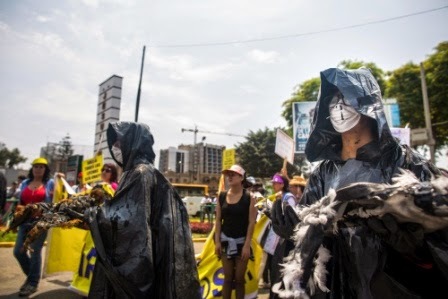 But global-scale environmental crises that began with industrialization became obvious to more people beginning in the 1970s, when it was noted that the environment and the economy were colliding with each other. Sachs was a college student at the time. 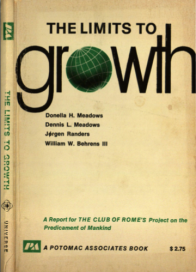 An economics professor assigned the class to read the now-classic 1972 book The Limits to Growth, and then told the students not to worry, because there would always be more. Sachs began his professional life believing what the professor said, and only later realized it wasn’t true. The technological revolution that began 250 years ago, he said, has brought unprecedented opportunities and threats. 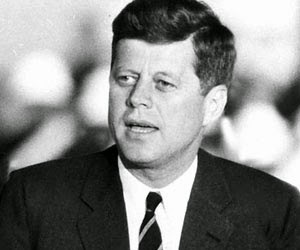 He quoted from John F. Kennedy’s inaugural address: “For man holds in his mortal hands the power to abolish all forms of human poverty and all forms of human life.” Kennedy was speaking of nuclear power, but what he said is even more true today. Much of the world has now been lifted out of extreme poverty. Yet inequality continues in new forms of slavery and human trafficking, lack of social inclusion, and the emergency of climate change. 2014 was hottest year on record, with typhoons in the Philippines, drought in Sao Paulo and the U.S. west, and the worst flooding in 500 years in Indonesia and the Balkans. Many other, slower disasters are also unfolding. development and inclusion of all in the good that we produce. He cited the Catholic doctrine of the Universal Destination of Goods. According to Pope Francis, the most basic challenge is “the globalization of indifference,” which he calls on Christians to overcome. The momentum of our economic system is powerful and relentless in pursuit of money, Sachs said, but even the most powerful corporations can submit to decency. 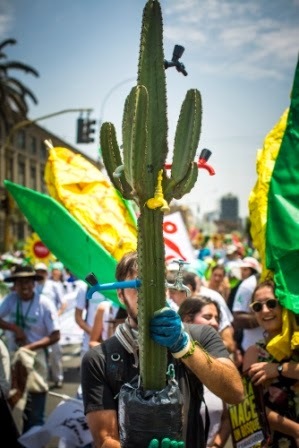 He told us that the COP 20 meeting was launching the most important year diplomatically that our generation has seen. Three other major summit meetings will mark 2015. Next July in Addis Ababa will be the third annual Conference on Financing for Development, which will seek reforms in the financial system to bring it into alignment with sustainable development. In September they will meet again to approve sustainable development goals for the next 15 years in order to end extreme poverty and to promote education, health, gender equality, social inclusion, biodiversity, and strong ecosystems resistant to climate change. Then in December, COP 21 in Paris will seek to develop a framework for climate safety. "Let us not be blind to our differences--but let us also direct attention to our common interests and to the means by which those differences can be resolved. And if we cannot end now our differences, at least we can help make the world safe for diversity. For, in the final analysis, our most basic common link is that we all inhabit this small planet. We all breathe the same air. We all cherish our children's future. And we are all mortal." We drove another 75 miles that night to Huancayo, the capital of Junin province, a city of around 350,000 ten times La Oroya’s size, and just a little lower in altitude. We stayed on the main street—my window faced the huge dome of Huancayo Cathedral, and the music and car horns continued well into the night, even in the rain. Our daytrip from Huancayo took us in two directions: first north (I think) along the Cunas River to the lovely farming countryside of San Jose de Quero, and later back through the city and east to the melting tropical glacier Huaytapallana. 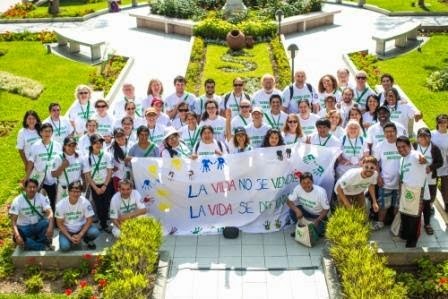 Centro Ecuménico de Promoción y Acción Social, or CEDEPAS (The Ecumenical Center for Advocacy and Social Action), is another NGO with which Joining Hands works. One of their projects is called “Healthy Homes,” which creatively and sustainably helps upgrade living standards for extremely poor peasant farmers. We visited the Samaniego Vera familiy, a couple who had worked with CEDEPAS to improve their farm in several basic but striking ways with the help of affordable tools and clever technology. Maria Milagros Ysuhuaylas Orellana, a young CEDEPAS engineer, explained the operation. A simple biodigester, consisting of a large black sausage-shaped membrane in a trench, covered by greenhouse plastic to warm it in the Andean cold, coverts manure from their cows and other livestock into methane gas and liquid fertilizer. The gas is piped to a second membrane to hold it for use in a small kitchen stove. It burns cleanly and, most of all, it’s plentiful and free. The couple also has a simple solar water heater for showers and hand washing, a great comfort in the cold climate. Next to this, a large pen houses guinea pigs for meat, and a greenhouse grows vegetables and fruits that would not otherwise survive here, leading to healthier diets, greater food security, and less need for cash. The couple seemed quite happy with the improvements, which they built with CEDEPAS’s help. The hope is to expand such outreach to thirty more families. We drove next to the glacier Huaytapallana. The countryside along the way was hauntingly foreign and beautiful. The boggy ground is filled with tiny water holes, star-shaped mosses, and diminutive mounds. Searching for comparisons, I suggested the Scottish highlands, and someone else mentioned Ireland. It looked like sphagnum moss to me. down to the cities now, in a few years its loss will mean severe drought for Peru. Walter Lopez Rosales, whose title I think translates to Regional Manager of Natural Resources, talked to us about the glacier loss resulting from climate change. In Peru deforestation is the number one cause of increased greenhouse gases. He described the ongoing work of adaptation and reforestation. After a second night in Huancayo we took a bus back to Lima. This was no Greyhound! There was plenty of leg room, and even foot rests in this double-decker bus, and flight attendants too, serving meals and drinks. Very cushy. With much more amazing scenery, of course, than plans have. If the U.S. had buses like these, they would be our transportation of choice. We rose early for the chartered bus from Lima to Huancayo in the Andes. When it was delayed, we passed the time getting to know our traveling companions. Lima, a city of nearly ten million, shows all the economic contrasts of many fast-growing world cities. A few days later we would visit a shiny new shopping mall on a cliff overlooking the Pacific. But our ride out of town today took us past shambly shanty towns of rebar and concrete, looking a lot like others around the world. Distinctive to these, though, were the bright colors of many exteriors—greens, pinks, blues—as they crowded themselves one beyond another, rank on crooked rank up the mountainsides. The road inland follows an old mining railroad that includes some of the world’s stunningly highest bridges and tunnels. The dramatic western slopes of the Andes lack vegetation, resembling Arizona’s rocky cliffs rather than the rainforested tropics I had expected. As you climb higher from the desert, dark green scrub carpets the mountains, softening their starkness. You know when you are about to glimpse a waterfall by the line of green vegetation that traces it. We drove past one foreign mining operation after another, and the towns surrounding them, until we reached Ticlio Pass at nearly 16,000 feet and began to descend. In the late afternoon we reached La Oroya, mentioned in my first Peru post, the subject of this film and this one, which features our host, Jed Koball, speaking about the children of La Oroya. There a mining operation owned by an American billionaire has left the river and the children severely poisoned by lead. If we don’t realize on a gut level the relationship between consumer thirst, especially for metals, and worldwide pollution and poverty, La Oroya awakens the conscience like no other place I have been. We stopped at Filomena Tomaira Pacsi, an NGO in La Oroya with which Joining Hands partners. The climb from the bus up two flights of stairs at 12,000 feet was when we felt the altitude most. On the one hand, I felt light in the thin air, almost floating, as if on the moon. Would that I had floated up the stairs! We took them slowly, chagrinned at the sudden weakness of our lungs and legs. We were greeted by Esther Hinostroza, Wilmer Chipana Veramendi, and others at FTP with steaming cups of coca leaf tea, a traditional altitude remedy. I later learned that coca is the source of cocaine, though it is a perfectly legal traditional medicine in the Andes. Soon our hosts, who had waited for hours to greet us, spread out tropical fruits, flatbread, and cheese, followed by bowls of chicken stew. Through translators they explained the economics of foreign mining operations, which exploit workers or refuse to hire locals, and destroy community health. 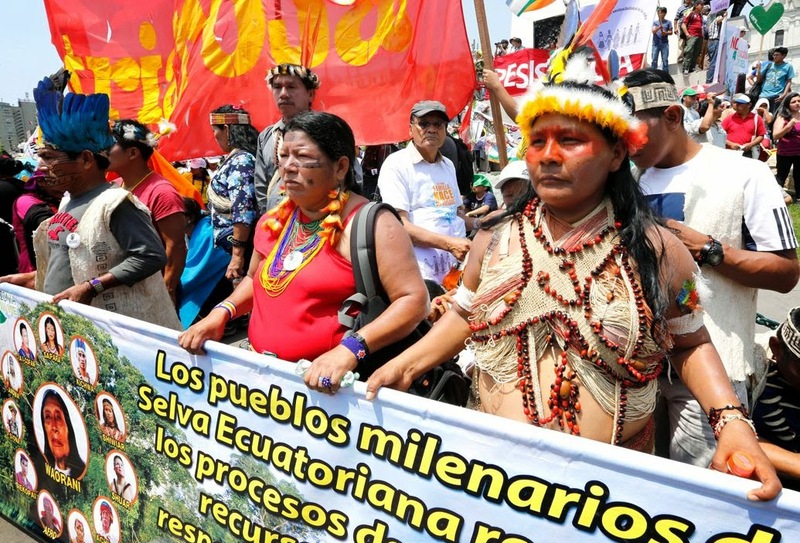 They take but do not give back to the communities from which the minerals are taken, and leave the country devastated environmentally and economically. The poisoned river runs orange through La Oroya, but parts of the town itself, perched high in the Andes, is breathtaking, haunting, as this dusk photo as we left FTP shows.